The Department of Defense released Friday the names of three Americans who died in a suicide bombing at a restaurant in Manbij in northern Syria. A fourth U.S. casualty was a military contractor and has not yet been identified in the attack that is said to have killed 15 people. The three people who died in Wednesday's attack are Army Chief Warrant Officer 2 Jonathan R. Farmer, 37, of Boynton Beach, Fla.; Navy Chief Cryptologic Technician (Interpretive) Shannon M. Kent, 35, of upstate New York, and Scott A. Wirtz of St. Louis, Mo., a civilian who was assigned to the Defense Intelligence Agency as an operations support specialist. Farmer was a Green Beret, the Associated Press reports. His father told the news service that Farmer had been in the military for 13 years and had been previously assigned to Syria, Afghanistan and Iraq. Kent was a Navy interpreter and a mother of two children, the AP reports. New York Gov. Andrew Cuomo said Kent grew up in Pine Plains, N.Y., and was the daughter of a state police field commander. Cuomo ordered flags on state buildings lowered to half-staff in Kent's honor. Wirtz was a former Navy SEAL and he will be buried at Arlington National Cemetery, the AP reports. The bombing undermined recent claims by the Trump administration that the Islamic State has been defeated. In December, President Trump said, "We have won against ISIS. We've beaten them and we've beaten them badly. We've taken back the land. And now it's time for our troops to come back home." Wednesday's attack showed a different reality. Pentagon spokesman Charles Summers Jr. said in a statement, "As Wednesday's attack demonstrates, ISIS remains a threat. We will continue to hit the remnants of ISIS hard to destroy any residual networks and ensure its enduring defeat." Manbij is on Syria's northern border with Turkey. The town was once under ISIS control until Kurdish troops backed by the U.S. drove them out. NPR's Tom Bowman reports the U.S. has outposts on the Turkish border and that Americans routinely patrol in Manbij. The U.S. has been training local forces to take over patrolling duties — a handover that has been thrust into uncertainty by Trump's December announcement the U.S. will withdraw. In July, Sen. Lindsey Graham, R-S.C., visited the area. He said Wednesday that the president should "look long and hard at where he's headed in Syria." Graham said he believed he had eaten at the restaurant that was targeted. A vegetable seller near the restaurant told The New York Times that Americans were a regular presence there. That may have left the troops exposed, said Seth Jones, a counterterrorism expert at the Center for Strategic and International Studies. "A number of Americans had frequented the restaurant," Jones told NPR. "Members of Congress, civilians, intelligence officials, including ones from the Defense Intelligence Agency. That raises a lot of questions about the operational security procedures the Americans were practicing while there." Jones said the Islamic State has moved into a "guerrilla phase" with the U.S. as a major target. Previously, Jones said, ISIS faced off directly against Iraqi and Syrian security forces. However, the group has lost territory in recent years and they have adapted their approach. Kurdish-led forces have been concerned with ISIS sleeper cells, according to CNN's Clarissa Ward, who reported from Manbij days before the attack. She said two local security offers had been killed in a bombing the day before the Americans were targeted. When NPR's Bowman visited Manbij in February 2018, he found a lively town of about 100,000 residents with a bustling market and functional schools more than a year after the Islamic State had been forced out. 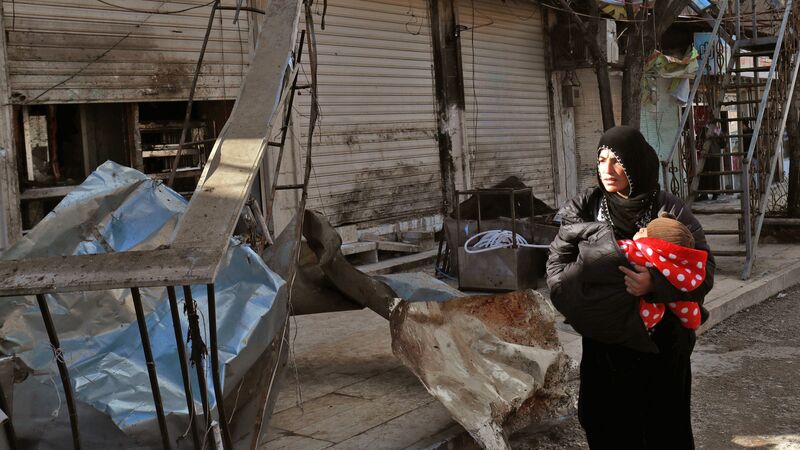 But the legacy of the extremist group remained close, in the severed limbs of residents who survived the Islamic State's harsh justice system and in the threat of ongoing attacks. ISIS fighters slipped back in for occasional attacks including a March 2018 bombing that killed American Master Sergeant Jonathan Dunbar and a British soldier. Kurdish forces told Bowman they were strained between fighting the Islamic State, fending off Turkish forces to the north and defending against militias associated with the regime of Syrian President Bashar Assad to the south. The possible U.S. withdrawal has rattled Kurdish forces. In December the official Kurdish YPG twitter account tweeted, "We invite the Syrian government forces to assert control over the areas our forces have withdrawn from, in particular Manbij, and to protect these areas against a Turkish invasion."